Red mullet, also known as ‘goatfish’, is an astonishing fish to look at due to its unique bright red skin. You can find red mullet in tropical and warm seas, especially the Mediterranean, most of the year. The best time to enjoy red mullet is between August and October. Red mullet should be avoided during its spawning season which is from May to July. Thanks to climate change and warmer sea temperatures around Britain, red mullet can now be fished sustainably on British shorelines all year round – a perfect excuse to pay greater attention to this fish. The term ‘red mullet’ actually refers to two related species of fish: there is the common red mullet with a pinkish flesh and striped red mullet with racing stripes. Both varieties are unrelated to the grey mullet. Red mullet is known for its high levels of omega-3 fatty acids, iodine, iron and phosphorus, so it’s healthy as well as delicious. To get the best flavour from red mullet, it is important to buy the freshest available – the flesh should be firm. the eyes should be clear and bright and the gills bright red. The smell of the fish shouldn't be strong or fishy. When choosing fillets of red mullet, look at the flesh to check that there is no discolouration or damage. The bigger the fish, the better in terms of both taste and lessening environmental impact – The Good Fish Guide advises against buying fish less than 16cm in length as smaller fish will not have yet reached maturity. Choose gill or seine-netted fish where possible. Red mullet does not keep particularly well, so eat on the day of purchase. 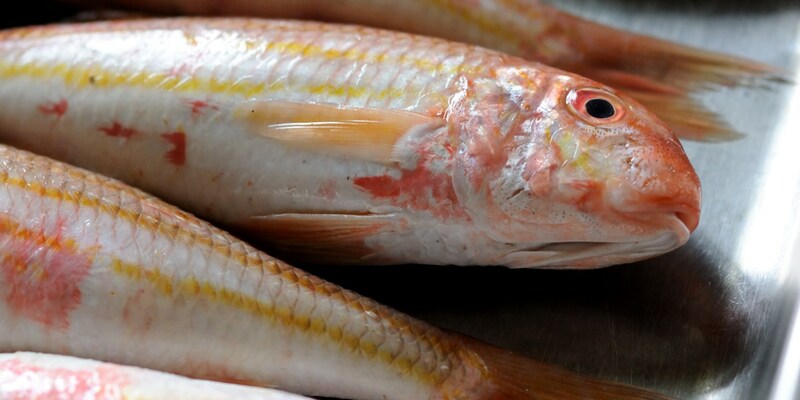 Red mullet is such a flavourful fish in part due to its high fat content. It suits simple cooking methods particularly well – just make sure not to overcook the fish as the flesh will go from deliciously moist to dry. No matter how you prepare the fish, make sure you hold on to the livers, as these are a real delicacy and are beautiful fried off with a few garlic cloves – a real ‘cheffy’ option. For a super-flavourful finish, red mullet can be eaten whole with their innards intact, though they can also be gutted and de-scaled if you don’t have the stomach for this particularly intense preparation. Red mullet is a great fish to cook whole and on the bone which helps to impart a deeper amount of flavour. You can roast whole by sprinkling with herbs and dousing in oil before cooking for a few minutes in a hot oven, en papillote (in a bag) or on the barbecue. The skin of the red mullet is a particular draw – correct cooking will produce crisp, salty, unctuous skin that Nathan Outlaw’s describes as ‘fish crackling’. Red mullet can be filleted with some nifty knife skills or prepared by your fishmonger. For beautifully cooked fillets, simply fry, skin-side down, in a hot pan with olive oil until the skin is crisp, as Robert Thompson suggests in his recipe for Seared red mullet on courgette tagliatelle with scallops and purple basil pesto. Red mullet is classified as a white fish but has a much stronger taste than many of its counterparts. The flavour lends itself to punchier ingredients – floral herbs like rosemary, thyme and oregano will stand up to red mullet bravely as will chilli and garlic. Red mullet is a typical Mediterranean fish and therefore can be accompanied by other Mediterranean ingredients such as squid, tomatoes and fennel or Parmesan, artichokes and green olives. Red mullet has a real taste of shellfish probably because that’s what they typically feast on. Keep this is mind when constructing a red mullet dish by including flavours that partner particularly well with shellfish, like white wine, garlic and ginger.